The Touré-Raichel Collective takes that collaborative concept into new and less explored terrain. The piano is not usually associated with West African music, and Mr. Touré said that before meeting Mr. Raichel, he had always relied on stringed instruments such as the harplike kora and the ngoni to add color to his music. In November 2010, Mr. Raichel arranged for Mr. Touré to perform at the Tel Aviv Opera House and then joined him and a rhythm section the next day in a studio jam that lasted more than three hours. The session was recorded more as a keepsake for the participants than anything else, but when the American ethnomusicologist and producer Jacob Edgar, of the Cumbancha and Putumayo record labels, heard the tape, he was transfixed. After Mr. Raichel spent months editing the music into song form, “The Tel Aviv Session” was released early in 2012 and rose to the top of the Billboard and iTunes world music charts. That led to tour bookings around the world and, eventually, the recording of a second CD, “The Paris Session,” released last month. The new album, a free-flowing but somewhat more structured effort that has tracks ranging from a prayer sung in Hebrew to love songs in Bambara, French and Songhai (all languages spoken in Mali), was meant to have been recorded in Bamako, the capital of Mali. But the turmoil caused by Islamists associated with Al Qaeda forced a relocation to France, which in turn enabled the collective to incorporate Western instruments like trumpet and flute on some tracks. Playing together has required some adjustments but also encouraged both men to venture outside their traditions. Mr. Raichel is of Eastern European descent, but heard a lot of Ethiopian and Yemeni music in his teens and is probably best known in Israel for his work in pop music. For his part, Mr. Touré has worked hard to establish an identity and style different from that of his father, a towering figure in world music who died in 2006. He grew up hearing rock and other Western pop styles, which has “made him a little more adventurous than his father, but also less rooted in tradition,” Mr. Edgar said. 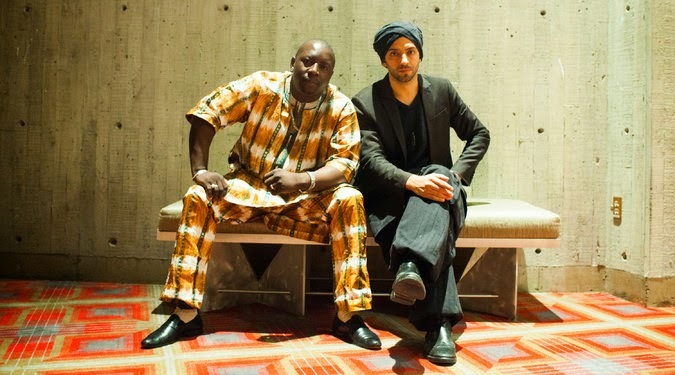 In a nod to Ali Farka Touré’s groundbreaking “Talking Timbuktu,” “The Paris Session” and the collective’s live performances, which on this tour Souleymane Kane on calabash and Yogev Glusman on bass, include a version of “Diaraby,” the best-known song from that album. But in place of the buzzing, riff-laden guitar dialogue of the original track, the Touré-Raichel version emphasizes the song’s crystalline melody and is performed as a simple duet for voice and piano. Though both artists want to continue to explore the potential that their meshing of styles offers, they are aware that there is also a political dimension to what they are doing. At a moment when the Middle East is in even greater turmoil than usual, with tensions between Israelis and Palestinians especially high, the symbolism of a Muslim and Jew working together is unavoidable, even as some pro-Palestinian groups deride Mr. Raichel as an apologist for the Israeli military.